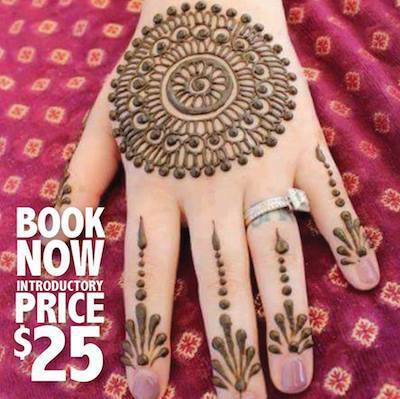 This summer, come and learn the ancient and beautiful art of henna with the delightful Darshana Wadnere of Vibrant Henna Art. Henna tattoos are temporary, herbal and organic and in this fun and interactive two-hour workshop, you'll have the opportunity to create your very own henna art tattoo! Held at Girl Guides Hall in North Rocks, this unique workshop is open to all ages and is customised to suit all skill levels. As part of the experience, Darshana will discuss the fascinating history and tradition of Henna Art, which has been used for thousands of years across many cultures and plays an important part in marriage and rites of passage ceremonies. The Henna tattoo is created with the crushed leaves of the Henna plant, which contains a natural dye. The Henna plant is one of the oldest cosmetics ever used and is completely harmless and is extremely safe. When the paste is applied to the skin, it feels cool, this is due to the natural cooling properties of the Henna plant. The process is pain-free and it is quite relaxing and enjoyable, especially in the summer months, as it's soothing to the skin. Once your design is complete, it will last from one to three weeks on the skin, depending on your body temperature, skin type, body chemistry, lifestyle, and where it is applied. If you have ever marvelled at a Henna tattoo and wondered if you could try your hand at it, come and take part in one of Darshana's workshops. You can even attend with a few friends or make new friends at the workshop. Workshops are currently scheduled for the 22nd and 23rd December 2016 and 7th, 14th, 21st and 28th of January 2017. The workshops will run from 9am to 11am at Girl Guides Hall, Baden Powell Place, North Rocks. Early bookings are encouraged as there are limited places available: to secure your place, please contact 0431 938 938 or send a message via the official Facebook profile. Gift vouchers are also available and make a great gift idea for Birthdays and Christmas. For more information on the workshops and to see some of Darshana's designs, please 'like' the Vibrant Henna Art Facebook. I have a friend who would absolutely love to do this, thanks! Hi please contact Vibrant Henna Art on 0431938938, thanks.